The Los Angeles Dodgers have yet to name a starter for Tuesday's interleague game against the Texas Rangers and at the rate they are going, unknowns with the rotation are doubtful to cause any stress. The Dodgers have been reborn in recent weeks, all while their projected 2018 rotation has fallen by the wayside. Clayton Kershaw, Rich Hill, Kenta Maeda and Hyun-Jin Ryu all are on the disabled list. Maeda is expected to return Wednesday. Alex Wood has been in the midst of what he calls "probably the toughest of my career," according to the Los Angeles Times. Wood has not been on the DL this year, but has been removed from two starts with leg cramps and has been erratic of late. Yet the Dodgers (33-32) continue to emerge from a brutally slow start thanks to a resurgent offense. The Dodgers have crushed a baseball-best 26 home runs in June, hitting three of them in seven of the nine games this month. Rangers veteran Bartolo Colon has the unenviable task of slowing the Dodgers' June rush. The right-hander is coming off a victory against the Oakland A's last week when he gave up two runs over five innings while throwing 97 pitches. A team off day Monday will give Colon an extra day of rest. The 45-year old is one strikeout away from 2,500 in his career and three away from tying Christy Matthewson for 33rd place all-time. Colon is 2-5 lifetime against the Dodgers in 10 starts, posting a 5.28 ERA. He is 2-2 in five starts at Dodger Stadium with a 5.97 ERA. Despite running through a number of starters this year, the Dodgers do have options when it comes to Tuesday's game. Both right-hander Brock Stewart and left-hander Caleb Ferguson have made starts with the club this year, but both are back at Triple-A Oklahoma City. Daniel Corcino, who has made six starts in 10 appearances at Triple-A, is currently on the major league roster. And twice on the most-recent road trip, the Dodgers patched together a bullpen game, using a short reliever as a starter. 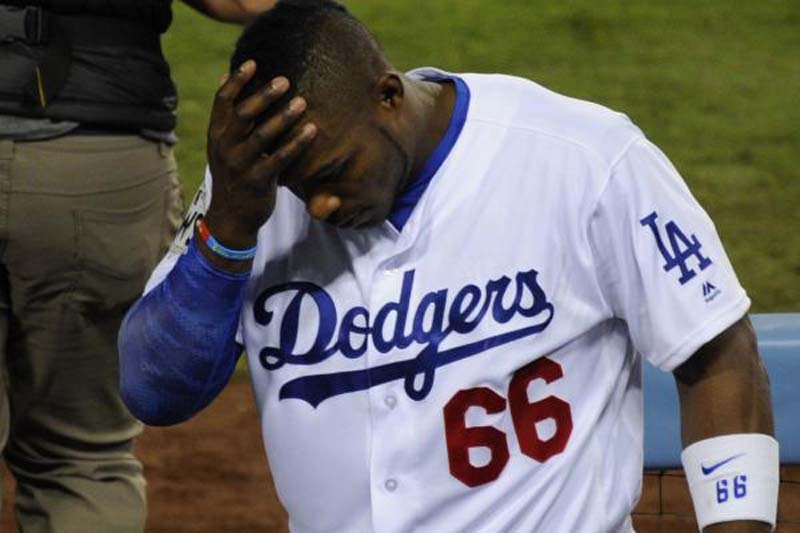 The Dodgers do have two off days this week to help them get through that type of scenario. And while the pitching has been solid for nearly a month now, it is the offense that has done the heavy lifting in leading the Dodgers to a 17-6 record since May 17. Since May 25, Matt Kemp has a 1.089 OPS, while Max Muncy has home runs in three consecutive games and has delivered a whopping 1.711 OPS during a career-best seven-game hitting streak. The Rangers, meanwhile, were just swept in a four-game series against the Houston Astros and are just 3-6 this month and 5-9 going back to May 27. Tuesday's game will mark the return of Adrian Beltre to Dodger Stadium. Originally signed by the Dodgers in 1994, Beltre has 66 career home runs at Dodger Stadium in 489 games. His 3,087 career hits are two shy of Ichiro Suzuki for 21st all-time. The Rangers (27-41) did score seven runs in Sunday's defeat to the Astros, but in their five other defeats this month they never scored more than three runs. "Yes, losses hurt (but) there's still development in process here, and I'm not going to focus solely on the offense," Rangers manager Jeff Banister said, according to mlb.com.